Lucifer and Amenadiel are on a tour bus. Lucifer is trying to convince Amenadiel to stay in L.A. instead of going back to heaven. Lucifer takes over the tour bus to make the trip more interesting, but Amenadiel gets off. Lucifer is talking it over with Dr. Martin. She wants to know why he thinks L.A. is his home now. Chloe and Lucifer investigate a crime scene involving a real estate mogul. Ella is there offering her own brand of humor. Lucifer gets a text from Maze that there's a problem at the Lux. He leaves. Chloe is not happy, because they have so many suspects they need to question. Lucifer gets to the club and finds out he's being evicted. Lucifer refuses to leave. The guy threatens him. Maze steps in. After the guys leave, Maze tells Lucifer that Charlotte is responsible. Maze is frustrated and leaves. She visits Amenadiel in his office to try to convince him. Charlotte shows up. She denies having anything to do with the murder. Amenadiel tells her Lucifer won't be leaving L.A. as long as the Lux is standing. Charlotte brightens as she walks away. At the crime scene, Ella pieces the champagne glass back together. She finds the son's fingerprint on the glass. Lucifer calls her to tell her he suspects the son. They head over to his place, but just as they go in, the son comes flying down and smashes onto a car. But the guy's not dead. Severely injured, but not dead. Chloe and Lucifer are at his house to question him. He's in a full body cast. The guy tells them the buildings were sold to another developer. They learn that payments were made to someone, but they don't know who. Charlotte visits her new client in the interrogation room...a bomb maker. She wants him to bring down the Lux. Charlotte shows up at the Lux where a sit in is taking place. She tells Amenadiel the guy she hired to bomb the building backed out. Lucifer introduces her to Dr. Linda. Chloe is questioning a guy when Dan comes in to tell her abou an illegal party happening at the Lux. Chloe shows up with cops, but sends them away and lets Lucifer stay. She DANCES with him!!! Dr. Linda is liking what she sees. Light bulbs go off with Charlotte. After everyone passes out, Chloe is back to work trying to figure out who the payments went to. She figures it out and wants Lucifer to come with her, but he's reluctant at first. Meanwhile, Amenadiel and Maze follow Charlotte who is having a secret meeting with someone who turns out to be Dan. Charlotte gets information from Dan then sleeps with him. Chloe and Lucifer discover that Eric's girlfriend Christy was the one who killed the dad. Chloe helps Lucifer save his home. No strings attached. He talks about it with Dr. Linda. 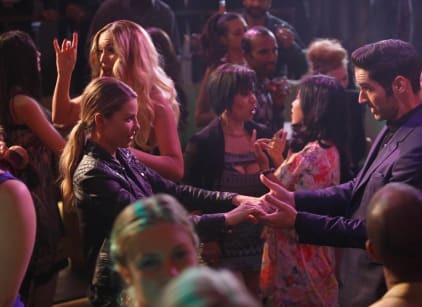 Lucifer had invited Chloe out to dinner for saving his home, but he blows her off after discovering via Dr. Linda that he's found what he's been looking for. Chloe leaves the restaurant. Charlotte has planted a bomb in her car and is waiting for her to step in it to blow it up.